The Falcon is a Rank V British self-propelled anti-aircraft vehicle with a battle rating of 7.7 (AB/RB/SB). 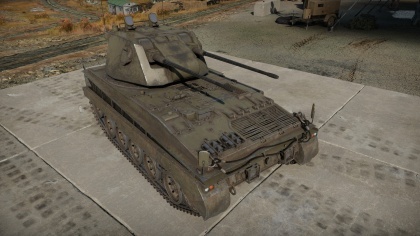 This vehicle was introduced in Update 1.57 "Battle March". While being an anti-aircraft vehicle, the Falcon has optimal performance against everything, assuming you have enough modifications. There are SPAA with higher fire rate, that can destroy planes instantly or harass them at great range, but have problems with medium tanks or tanks in general. There are SPAA that can destroy tanks, but can't shoot down anything besides bombers. Falcon can potentially do both. The Falcon looks like light tank chassis with slightly sloped round turret on the back. Turret also has 2 long autocannons on it's front. It's easy to realize it's falcon, there are not many vehicles like it on a field at it's battle rating. The armour is not very good, it protects from machine guns, but that's about it. Even fighter planes can destroy you, however, this vehicle is mobile and fast, compared to most adversaries it faces. It's also worth mentioning, that some shells do not detonate upon impacting falcon's armour, like IS-7's AP(HE)CBC, allowing you to run away sometimes. Autocannons tend to overheat if continuously fired, short bursts work best. Don't fire for longer than 6 seconds unless you try to destroy enemy tank's protection for allies. Recoil from guns slows you down and pushes you back. If you want to do run-n-gun attack, keep that in mind and try to fire broadside, if possible, as otherwise tank's turret might actually catch up to you. Ammunition is stored in one belt, which is good for last stand type of fight, but bad in general. Rearming the belt is only possible when you are empty, you can do that in capture point. It takes almost a minute, and then you also have to reload it for about a minute. You really don't want to run out of ammo, if your team is bad at controlling the map. You can be easily taken out even by fighter planes at that state, because your armour is weak. Armour is so thin, some heavy-caliber rounds won't detonate and only do damage in straight line. However, most of tanks like this have heavy machine guns, which can take Falcon down even faster, unless it destroys them first. Default AP-I, HEI-T* General combat. Avoid heavily armoured MBT at all costs, punish other SPAA and light tanks. 30x170 APHE-I AP-I, AP-I, AP-I, HEI-T* Belt adapted to hunt down light tanks. Damage to planes is reduced, but still adequate. 30x170 APDS-T APDS, AP-I*, AP-I*, HEI-T* Anti-tank belt. Flank and destroy careless MBT's, damage heavy tanks, while doing AA duty. Ammo racks of the Falcon. Generally Falcon drives around the battlefield, trying to hide in hard to notice flank positions or behind houses and shoots at planes. In case if someone drives by - flanks them and destroys them, if has AP belt. It's generally better to stay out of sight, using terrain elevation or houses. You only can choose one belt, AP belt is adequate for any work. If you want to shoot just planes you can take explosive ammo, but then you are completely useless against armor. APDS belt allows to harass even heavily armoured vehicles from sides. You wont need to reload until you are done. 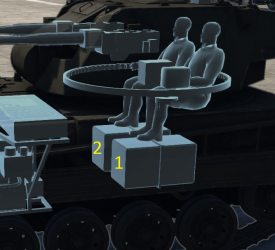 In case if some tank noticed you and wants to destroy you, you can use the fact, that tanks turrets are usually far from front of tank. Bait enemy towards your cover, stand far enough away from corner to see enemy tracks, but not to see enemy turret, and shoot cannons at track that is further away from you. That will force moving tank to topple over and mess with enemy aim. Before enemy realized what has just happened shred their side armour and destroy them. If that failed - run, they wont be able to get you anyway. You can do that in duels as well, however just destroying them is better at that point. In RB, it's possible to hide in forests, waiting for relatively poorly armored German medium tanks, light tanks and alike, however, if they notice your vehicle first you probably won't do enough damage to stop them from firing again. 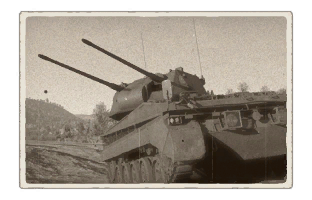 In AB, it's possible to just drive around and shoot at everyone, since it's even faster there, however, people dislike being shot at by auto cannons, and someone will certainly notice the noise and kill-feed, so don't expect to live long, especially against Soviets, who have lots of frontal armouring and BMPs, which are superior to you in every way. ATGM: These are worse than any tanks, because they wont accidentally hit your loader with AP shell, they will just explode you. Attack only when have upper hand, be that long range, cover, or surprise. Maus: It's invulnerable to you and has 2 cannons. Even IS-7 can technically be defeated in point blank duel with APDS from the rear, but not The Maus. In AB this means, that you can't drive anywhere it can look and fire at. AP and APDS belts are most effective when fired at your side armor or back of the turret. If you are attacked by falcon, just turn both hull and turret to take better angle against them. It's best to not let them get a jump on you at all, since it may be able to destroy 2 tanks before anyone even realizes what's going on. Just don't stand with your sides open towards flank directions, instead turn your hull's front and back there, if enemy you are currently fighting cannot fire at your hull anyway. On rare occasions, ramming the Falcon damages it's guns. Ramming at full speed often damages tracks or at least temporarily stops it. The Falcon has questionable accuracy at 2 km range, but it still can force you to disengage just by firing in your general direction. It's still better to not mess with falcon and avoid flying too much near to buildings, if you know it's there. Describe the history of the creation and combat usage of the ground vehicle in more detail than in the introduction. If the historical reference turns out to be too big, take it to a separate article, taking a link to the article about the vehicle and adding a block "/ History" (example: https://wiki.warthunder.com/(Vehicle-name)/History) and add a link to it here using the main template. Be sure to reference text and sources by using <ref>, as well as adding them at the end of the article. This section may also include the vehicle's devblog entry (if applicable) and the ingame encyclopedia description (under === Encyclopedia Info ===, also if applicable). This page was last edited on 11 March 2019, at 17:30.